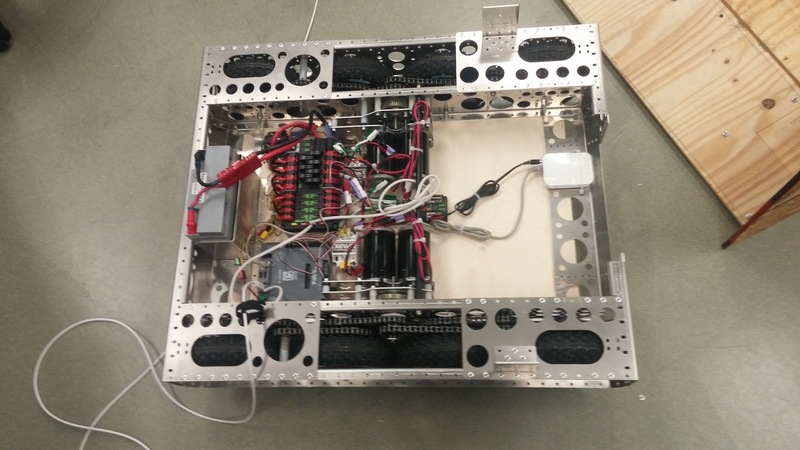 Here is the reveal of our 2016 FRC Stronghold robot, Ultraviolet. The video is of our practice robot. The competition robot will be very similar. We have plans for several more additional features for the coming weeks. The above link is the full CAD of the current state of the robot. Feel free to use anything you like from it. It's a bit rough in places but it's mostly complete. "Power consists in one's capacity to link his will with the purpose of others, to lead by reason and a gift of cooperation. ~Woodrow Wilson"
We had a bit of a scare this week. Our main manufacturing sponsor called on Wednesday afternoon to inform us that they weren't going to be able to do the main laser run of the season because their laser cutter went down and likely wouldn't be fixed until next week. This left us scrambling a bit. 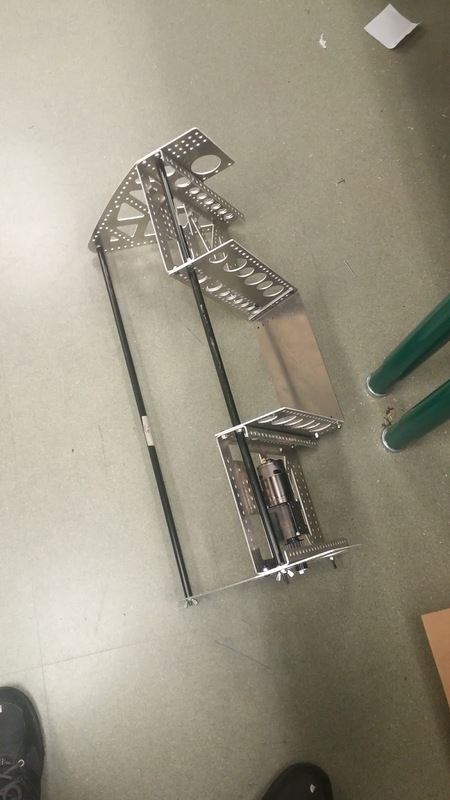 Amazingly all the people we told about this problem were very generous, offering to help make parts for us or even in the case of Dallas Jesuit (FRC#2848) offering to send us an entire spare sheet metal chassis in case we couldn't get ours cut in time. We are so thankful to have so many awesome friends in the FRC community. After a few phone calls on Wednesday we were able to secure STAR Precision Manufacturing here in Houston to do a quick laser run for us and still have Solarcraft our main sponsor bend the parts. We also were able to cut some of the parts we needed on our CNC router. We just got all the parts back this morning. We were able to get the practice robot up and driving and should have the real chassis ready for powder coat on Monday morning. 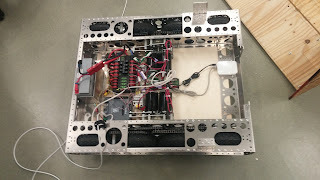 Tomorrow we will mount the intake on the robot and should be able to test the most important two functions of the robot Drive Train and Intake. We still have a few more things we are missing and will get made once our sponsor has their machine running again. We are missing the intake from the front of the robot, so the weight distribution is very bad in these late night tests. Our defense crossing will improve. This morning we also continued our monthly food distribution here at our school, we have partnered with several other organizations at the school to host a mobile food pantry on the 2nd Saturday of every month. Over 150 families get much needed food from this pantry. We spent a lot of time helping other teams this weekend. One rookie and two other teams came by for helping building their robot, building bumpers, or working out control system bugs, we are always happy to help out any teams that need assistance. We are reconsidering several of the things we decided on early in the season, the core of the design hasn't change but we are a little less sure of some of the details. We are are going to get our drive train and intake 100% complete then go from there. The drive train CAD is nearly complete. We have been referencing a lot of 1114's designs this year and their awesome Solidworks tutorial videos as well. We still have bumper mounts and a battery box to add to this before it is ready to be sent off to our fabrication shop, Solarcraft. Once we send it off for fabrication we'll post the CAD model to our Grabcad partner space. 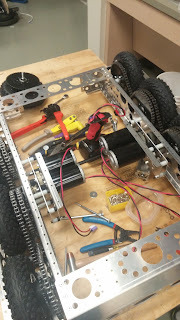 We discussed bumper mounting today and decided to use an idea from team 1983, Skunkworks, They used fixed clamps to clamp their bumpers in place on one of their prototype drive trains. We'll be supplementing this with bolts and PEM nuts but we want to make sure we have a quick and secure mounting system. We are taking extra steps this year to make sure our robot is as robust as possible. Rookie teams and 2nd year teams, please make sure you build a robust robot, a lot of things you could get away with last year will break on the field when you start jumping over defenses and hitting other robots. Make sure you bolt everything down and tighten all your bolts. Use lock nuts and/or thread locker on all your threaded fasteners.